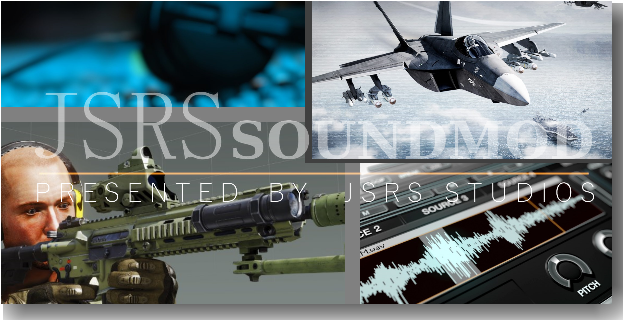 A sound mod for ArmA3 and ArmA3 Apex and RHS GREF and SAF Mods - The latest development by JSRS-Studios now covers the latest RHS content! The goal is to create a fluid sound transition between vanilla ArmA3 and RHS mod content weapons and, in later stages of the development, the vehicles! This is a CFG Bundle of JSRS Patches that were used in the past that are not available any longer. Download it, use it as a mod, load your mission/edited mission and save them again and the dependency is gone. Here is a short Sound Example for JSRS Soundmod[soundcloud.com]? Making sounds in high quality that is requested these days, you have to invest money into libraries and equipment. This money is not given by companies or customers, it's a self-made investment. Any sort of support or donation is required to keep this product running with recent updates and further developments. So feel free to support this project on Patreon[www.patreon.com] and be sure that your support is very welcome and appreciated! Copyright © 2018 by LordJarhead. Use the JSRS Soundmod Dependency Fixes that you can find in my workshop library. There is a installation guide and it will fix all these problems. Few days ago I've made a mission. Now I can't start it anymore. It says I'm missing "jsrs_soundmod_rhs_aaf_gref_weapons", but I'm using GREF. I have no idea how to fix it. Any help? Thought about combining all 3 soundmods into one pack? A seperate GREF and SAF would be ideal. is it possible to have only GREF without SAF?